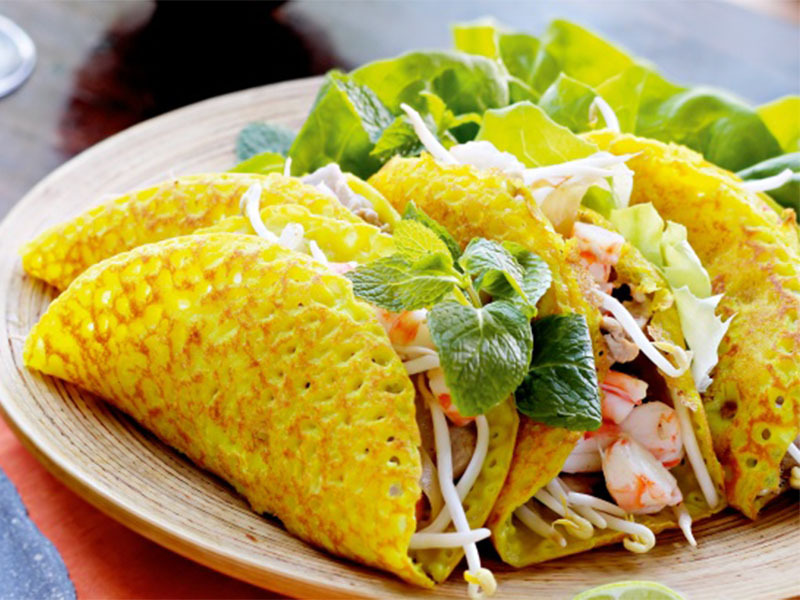 With this 5 days tour, you will have chance to witness the contrast picture between the urban and rural regions of Vietnam as join in highlights of the colorful South Vietnam. 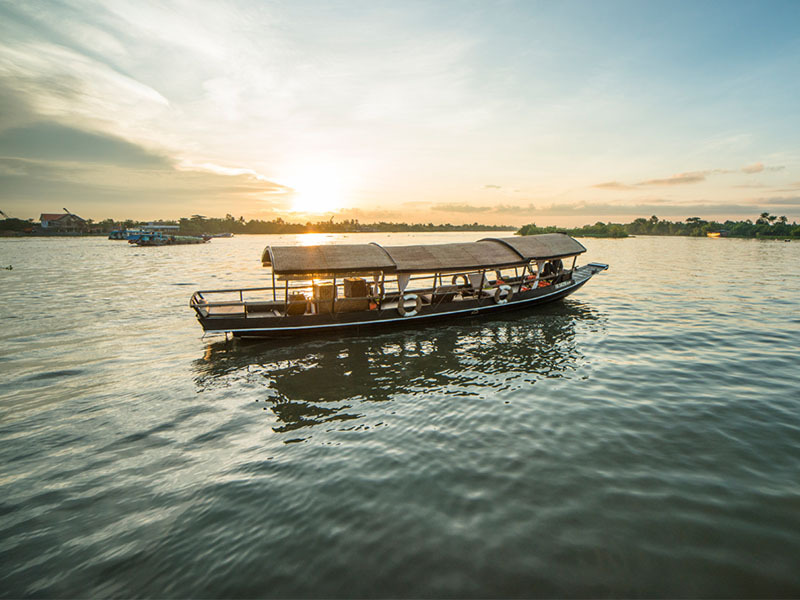 Get inside the Cu Chi tunnels by speedboat on waterway to witness the Vietnam’s War remains. Mekong delta is also interesting with floating markets, paddy fields, water buffaloes and tangled fruit orchards. All the unique beauties will be far beyond your imagination. - Visit an amazing collection of 3,000 items relevant to the development of traditional Vietnamese medicine in FITO museum, Vietnam's first traditional medicine museum. 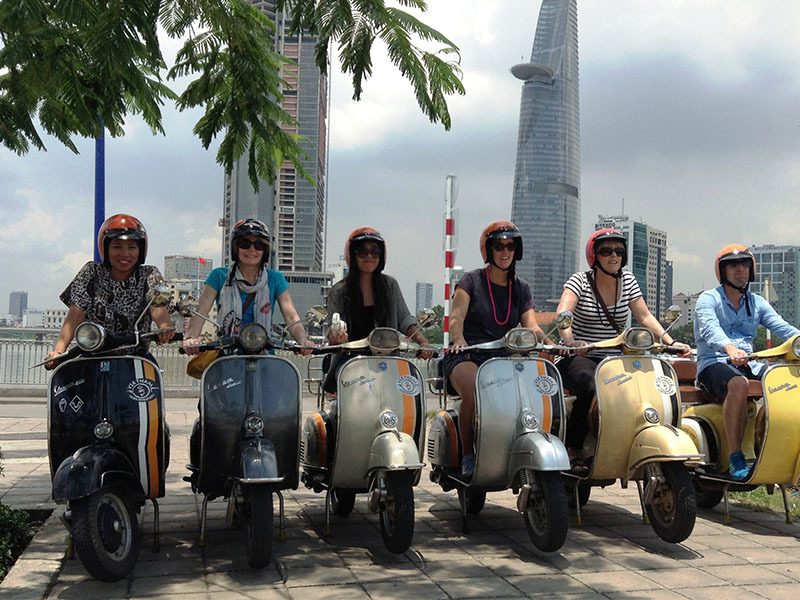 -	Experience Saigon streetfood nightlife the way locals do, all from the back of a vintage vespa. 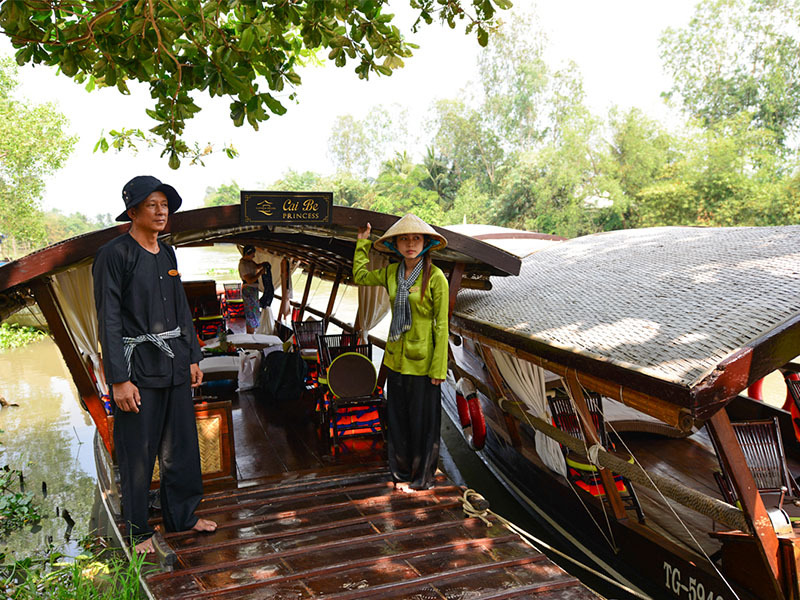 -	Fascinate daily life and products in Mekong Delta with “Deluxe” Cai Be princess cruise. 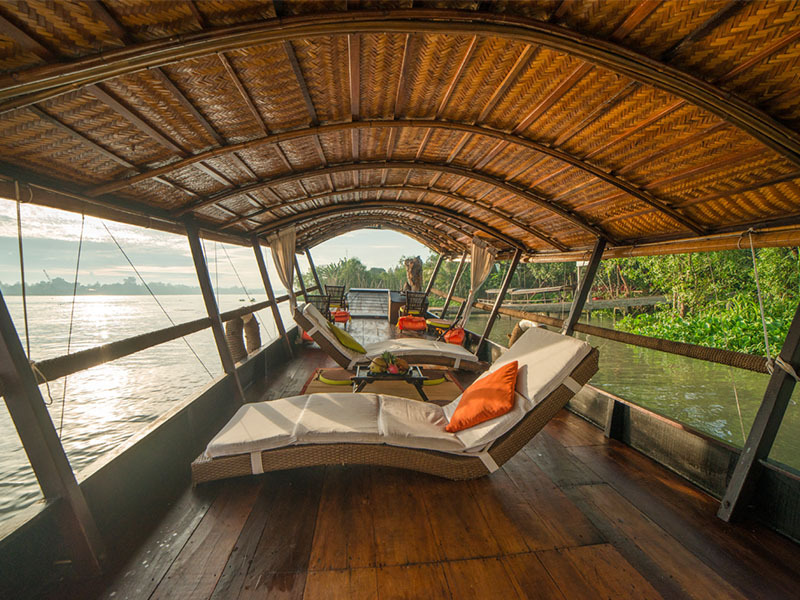 -	Cruise among local barges full of fruits and vegetables of Cai Be colorful floating market. 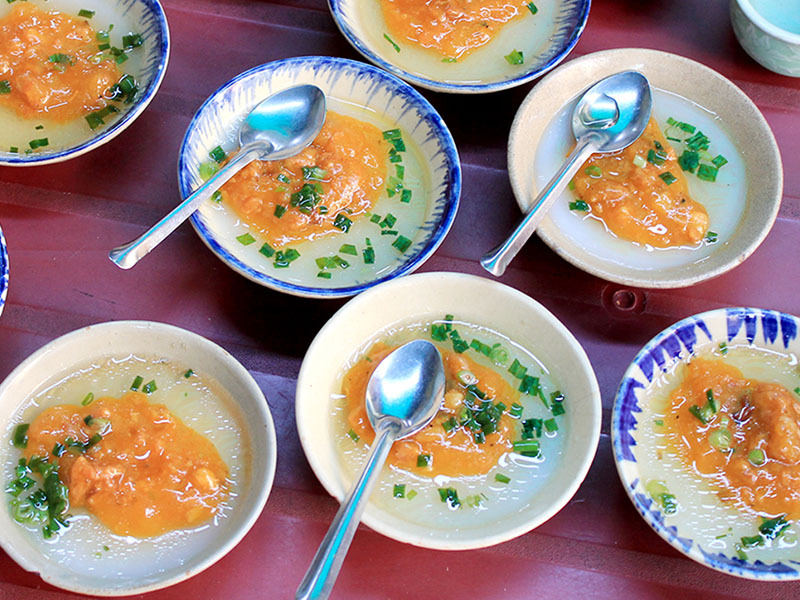 -	Visit the local village where the local people make pop rice and coconut candy. 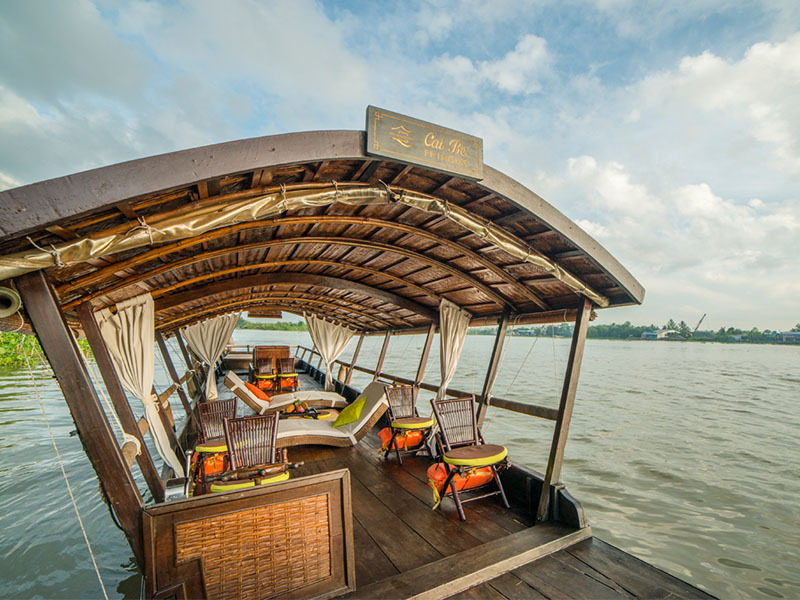 -	Take a luxury speedboat to Cu Chi and experience scenic of Saigon river. 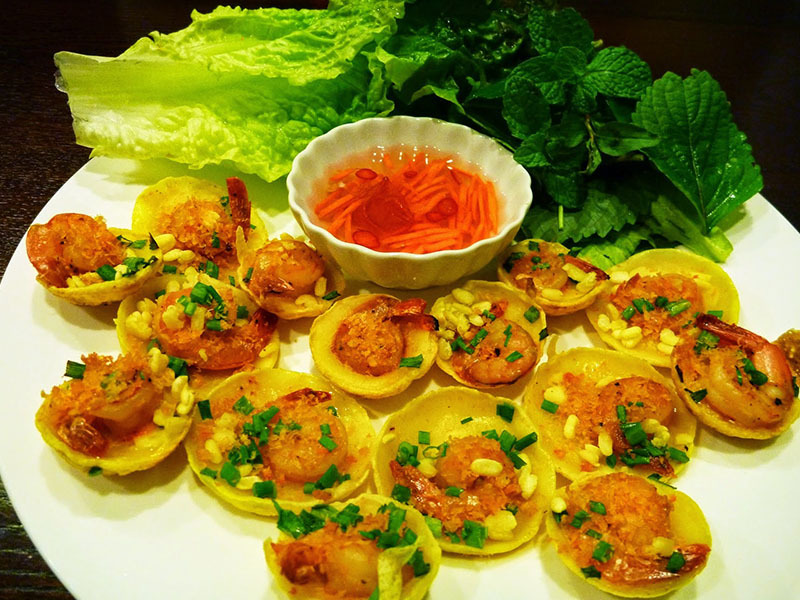 You will be welcomed at Tan Son Nhat airport and transferred to your hotel for checking in. (Check in time after 14:00pm). Free at you leisure in the evening. Overnight in Ho Chi Minh city. Start your sightseeing in the morning with a walking tour in Dong Khoi street and visit Notre Dame cathedral, the spiritual and cultural crucible of the French presence in the Orient & the General Post Office, City Hall and Opera House, the ancient & with French colonial architecture style. Then visit Reunification Palace which was the workplace of the President of South Vietnam & was then known as Independence Palace. Further, drive to visit the War Remnants museum for a vivid insight of the American war through the local’s eyes. 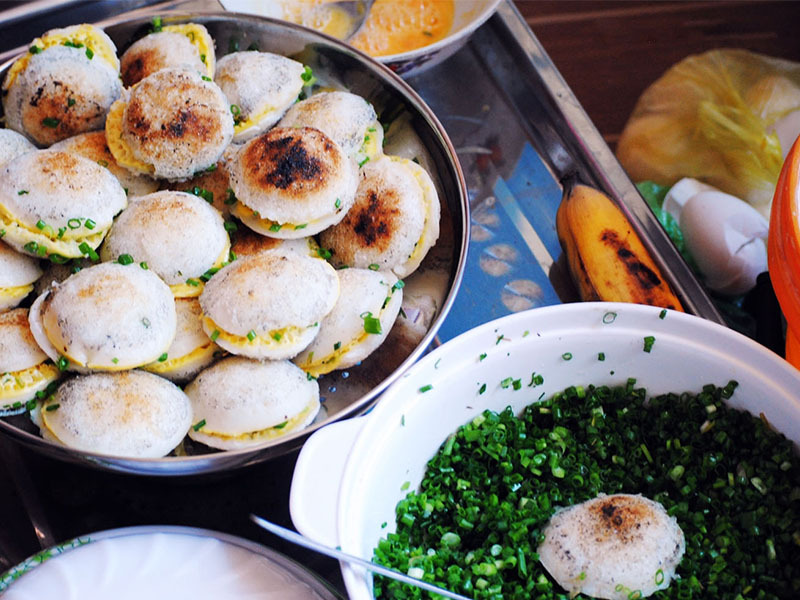 After then, visit Ben Thanh market which is always loaded with varieties of goods, such as consumer goods, cakes and candies, food and foodstuff, and particularly high-quality fruit and vegetables. After short break, transfer to visit the FITO museum, Vietnam's first traditional medicine museum displaying an amazing collection of 3,000 items relevant to the development of traditional Vietnamese medicine, implements used to prepare indigenous herbs, objects commonly found in traditional pharmacies as well as ancient books and documents on traditional Vietnamese medicine. Finish your city tour and transfer back to your hotel. Free at your leisure until Vespa Tour in the evening. 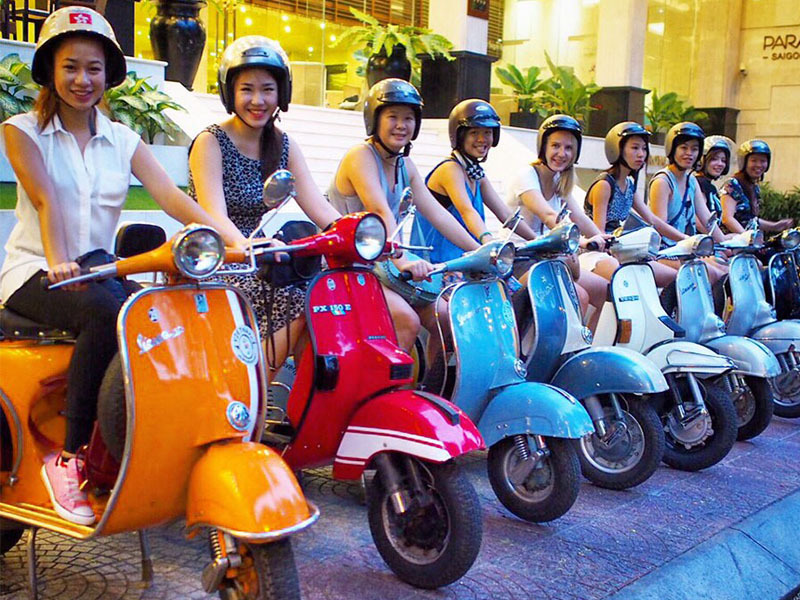 18:00pm: Vespa team will pick up you at your hotel and first stop is to Café zoom to "watch the world goes by" (quoted by The Lonely Planet) and enjoy cocktail and appetizer (inclusive) before adventuring into favorite local eating spot. 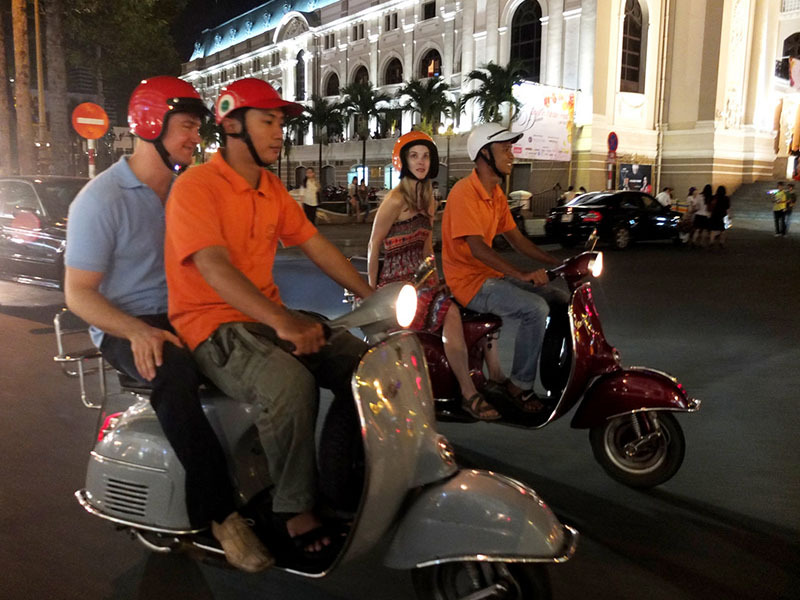 You will experience the nightlife of Saigon the way locals do, all from the back of a vintage Vespa scooter. 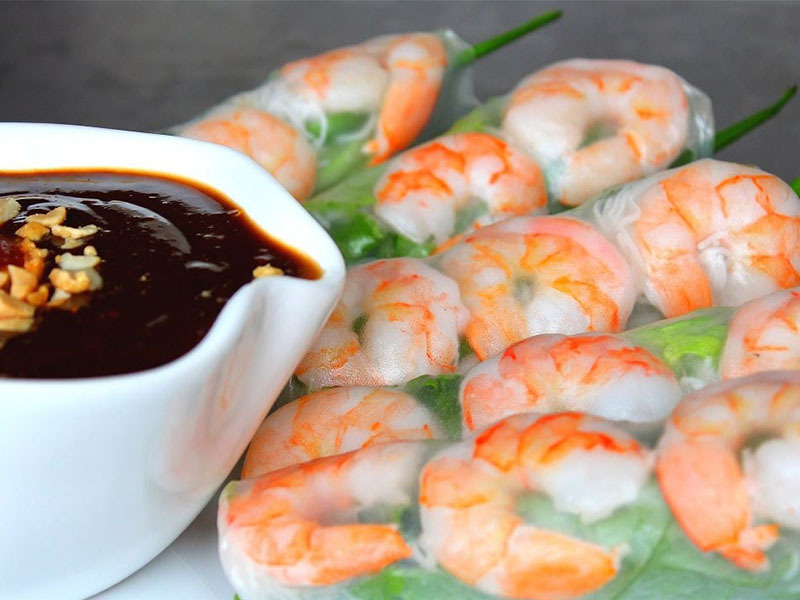 The tour will start with a ride to part Chinatown and then heading to District 4 through busy streets and alleys to see the night life of locals and enjoy street sea- food and cold drinks, places that foreigner won't be found. Leaving district 4 to district 3 the tour pass through downtown district 1 to take in the sights on the way to Banh Xeo, specialty of Saigon, and southern food with the locals. 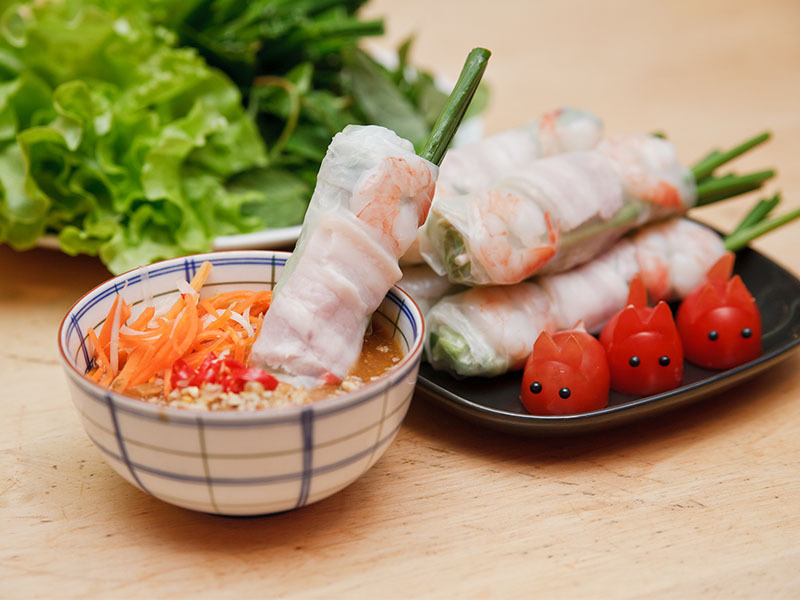 Then the tour will continue to a hidden Vietnamese-style coffee shop to have a taste of Vietnamese music (live) as a local. After this the tour will bring you to a lively bar to enjoy the drinks with live music. 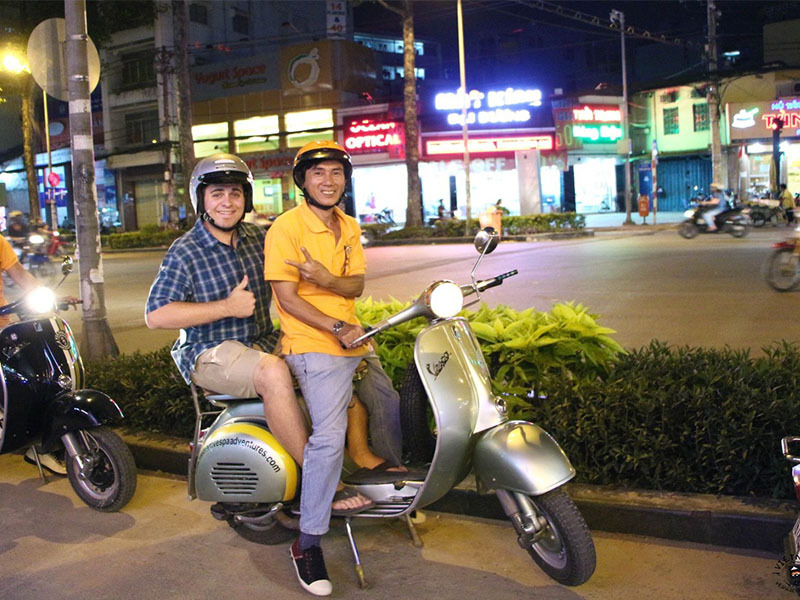 You ride pillion behind your drivers back to your hotel at 22:00pm. Overnight in Ho Chi Minh city. 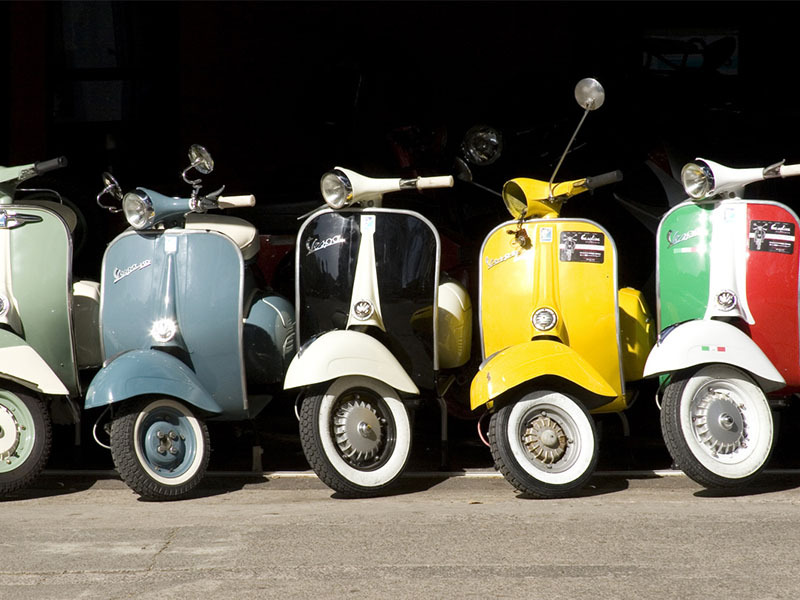 Note: Vespas by night tour included drivers, Vespa English speaking guide, dinners (2 stops), Bar and café (3 stops), at least one drink at each stop. 8:30: Drive to Mekong delta. Arrival at pier in Phu An hamlet at 10.00 AM. Welcome on board and fresh towels are served. Cruise to begin with the visit to Cai Be colorful ﬂoating market, cruising among local barges full of fruits and vegetables. Proceed to Dong Hoa Hiep Island located between Vinh Long and Cai Be to discover beautiful landscape along the river. Visiting the local village where the local people make pop rice, coconut candy, rice paper on their own way, the tourist do not only know how to make cakes but also try on and taste the warm one right after processing by the breezy river bank. Visit to ancient Mandarin house dating from 1890 with personal welcome by the House Owner. 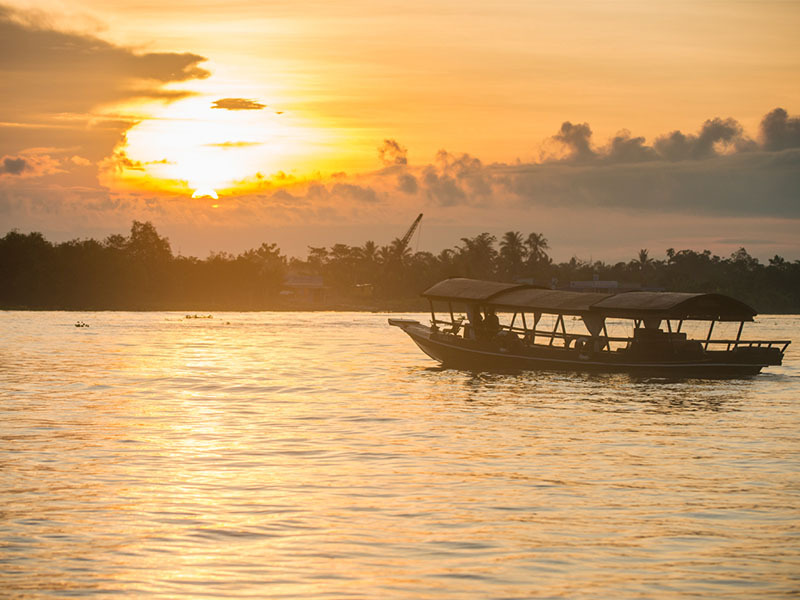 Observe the activity of rice business at the biggest rice market in Cai Be while sailing to visit a traditional brick factory or to learn how locals build houses with palm leaves. Stop at local home factories to observe the traditional procedure of making rice ice paste, coconut candies and other specialties. Transfer back to Ho Chi Minh city. Free at your leisure or have your own activities. Overnight in Ho Chi Minh city. -	During the cruise, cold towels, hot green tea, mineral water and exotic seasonal fruits will be served on board free of charge. Set menu lunch: Vegetable soup, Le Longanier fried spring rolls, fried Mekong elephant ear ﬁsh, fried mixed, vegetables with pork, caramelized pork in clay pot, seasonal fresh fruits. 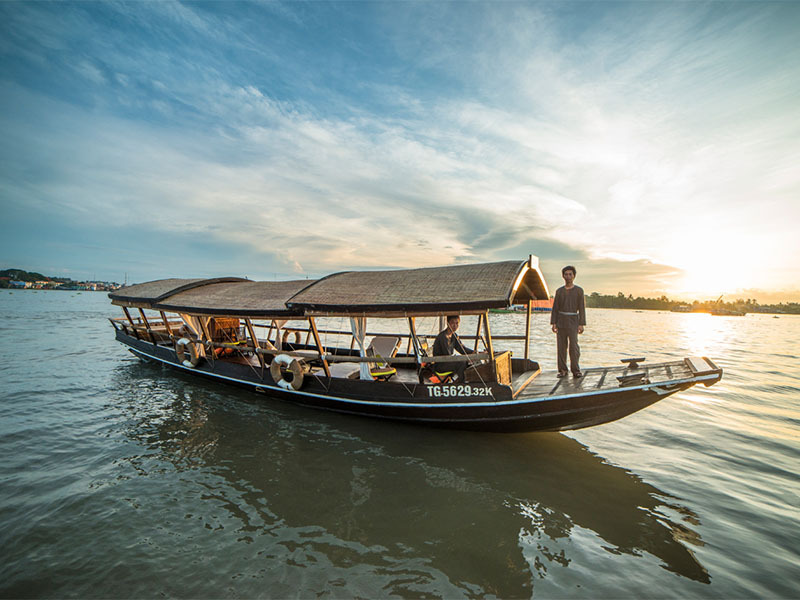 7:00am: Tour guide will meet you in the lobby of your hotel and bring you by car to your boat at Ho Chi Minh city’s central pier at district 1. 01:00pm: Arrive back at Saigon’s central pier. Transfetring back to your hotel by car. The rest of day you will have free time. Overnight in Ho Chi Minh city. 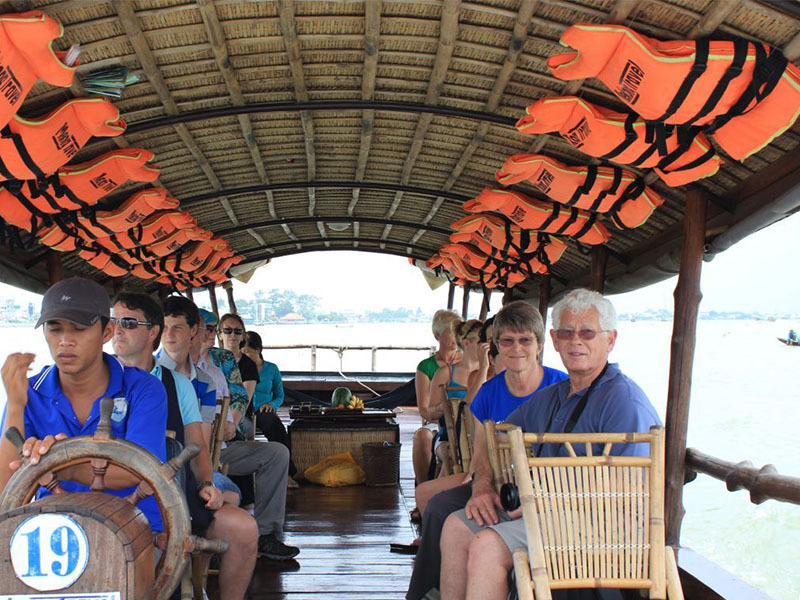 -	Cu Chi speedboat half day program is seat in coach tour (Joining tour with other guest on boat). 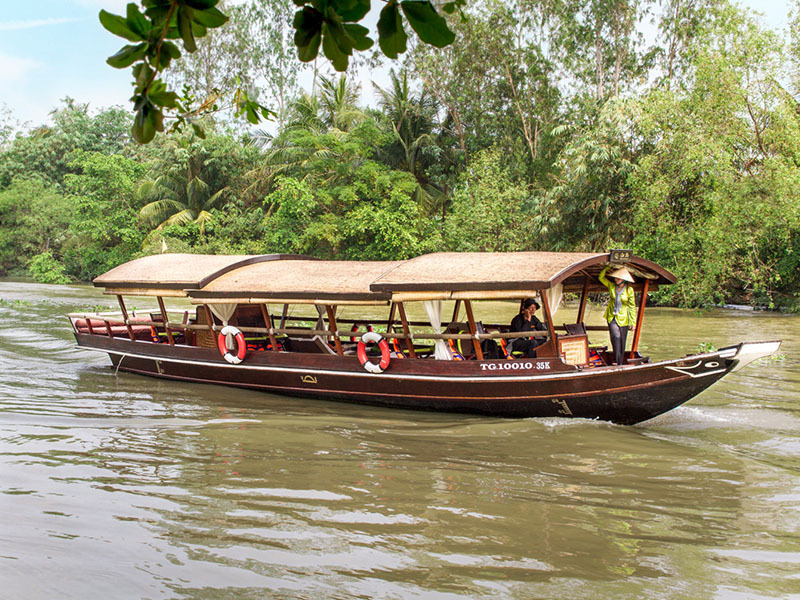 -	Boat tour will be offered with an afternoon schedule also which departs at 11:00 am and returns to Ho Chi Minh city at 17:00 pm.